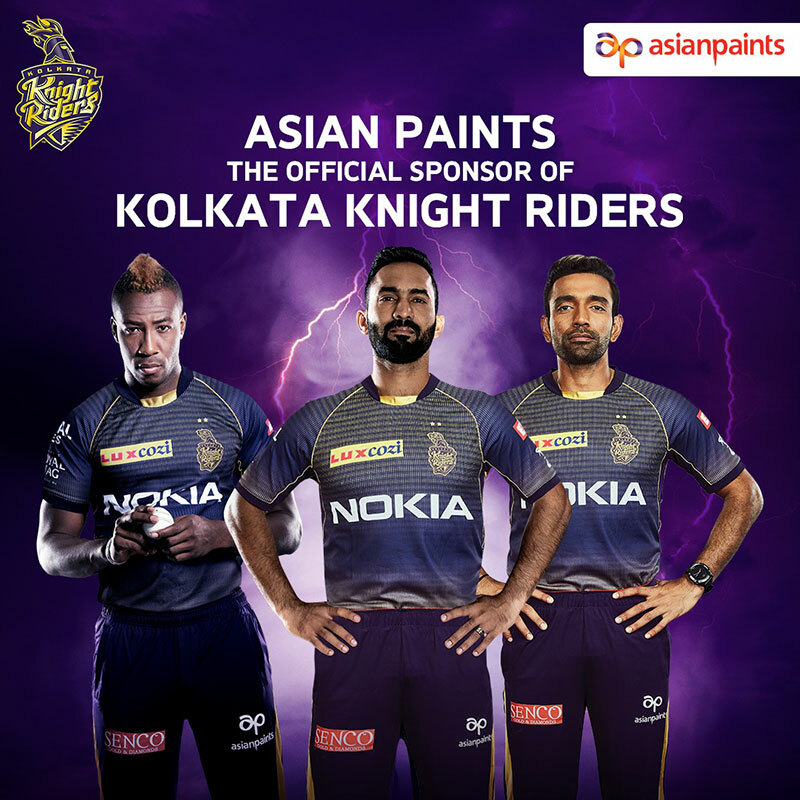 Asian Paints has announced their association as official sponsors for ‘Kolkata Knight Riders’ in addition to the continued association with IPL. In its 12th edition this year. March 27, 2019: With the ongoing IPL fervour and one of the most popular franchise-based sporting leagues in the world, leading paint & décor major – Asian Paints has announced their association as official sponsors for ‘Kolkata Knight Riders’ in addition to the continued association with IPL. In its 12th edition this year, IPL has successfully established itself as a premier and most watched T20 league across the world. Known for its high-quality cricket with best set of players and talent, Asian Paints focuses on enhancing the visibility and impact by associating with one of the world’s biggest sporting jamboree and the reputed KKR team. East is a priority market for Asian Paints. With this association, Asian Paints will be omnipresent on-ground and on-air with high decibel activities planned for the network and consumers at large. The lead trouser sponsorship will help the brand cut through the clutter of multiple brand advertisements during the league & help garner brand saliency. In addition to this, Asian Paints is also facilitating two meet and greets for its key stakeholders with the players of the KKR team. With the people of East India being avid sport lovers, Asian Paints will leverage this association by having activities planned for the consumers, network of dealers, AIDs and contractors. During the AMJ quarter, this sponsorship is anticipated to generate a stable and sustained reach and visibility for the brand. Founded in 1942, Asian Paints is a leading paint company with a turnover of Rs. 168.7 billion. Asian Paints operates in 16 countries and have 26 paint manufacturing facilities in the world, servicing consumers in over 65 countries. Asian Paints has always been a leader in the paint industry, innovating new concepts in India like Colour Ideas, Home Solutions, ColourNext, and Kids’ World.